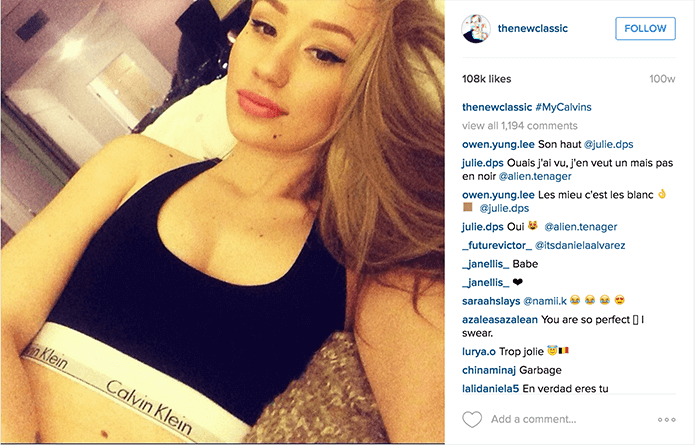 Calvin Klein has launched its latest Spring 2016 collection with another viral social media campaign. This time there was no need for large scale advertisements; but simply the profile of some big name celebrities and the hashtag #MyCalvins to capture the worlds attention.This digital campaign through Instagram asked celebrities to show themselves wearing Calvin Klein apparel with the campaign line – I _____ in #MyCalvin. Impressive names like Justin Bieber, Kendrick Lamar, Joey Bada$$, Abbey Lee and Kendall Jenner took part in the campaign, filling in the blank to personalise each image. 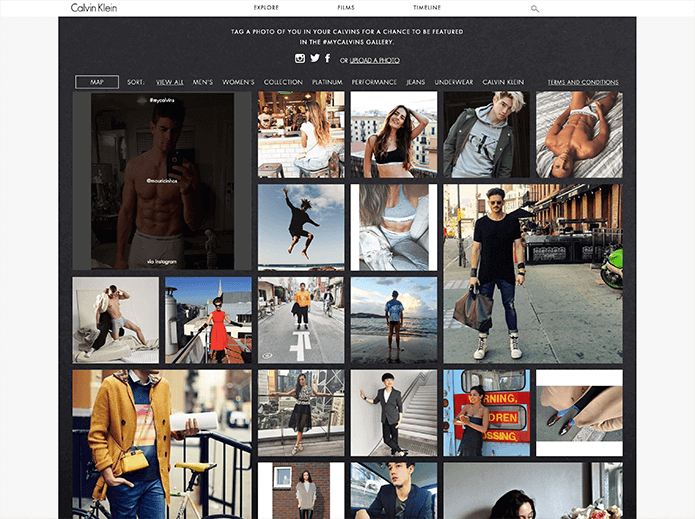 The campaign now has over 179,000 photos on Instagram tagged #MyCalvins mostly featuring models, bloggers and just general babes. These unpaid, authentic posts endorsing the brand are an extremely powerful way to interact with young people, far more effective than the more obviously paid for influencer posts or a printed ads. These images are relatively candid and have a sense of intimacy, setting a tone for the thousands of photos linked to the hashtag with the very best submissions making it to the #MyCalvins gallery – http://explore.calvinklein.com/en_SG/page/mycalvins/#. After just four months of the tag launching there were more than 4.5 million interactions between celebrity, influencers and brand-posted content. Iggy Azalea reached 108k likes on her #MyCalvins post, Miranda Kerr racked up 191k likes but no one flaunts it better than Bieber post with 1.6 million likes. It’s a no brainer to target celebrities who come pre-loaded with millions of followers. Justin Bieber boasts over 150 million followers across his social platforms and was ranked the most tweeted about musical artist of 2014. Linking him to any brand is inevitably going to spark attention. Bieber told WWD “I have been wearing Calvin Klein underwear for years in hopes of getting to model for the brand one day.” “Last spring, I posted a picture on Instagram in my underwear, using the #MyCalvins tag. Thankfully the brand saw it and liked the reaction it was getting, and a relationship started from there.” Since 2014 the relationship between Calvin and Bieber has boomed and as a direct result, Calvin Klein has gained 3.6 million additional followers across its social channel. 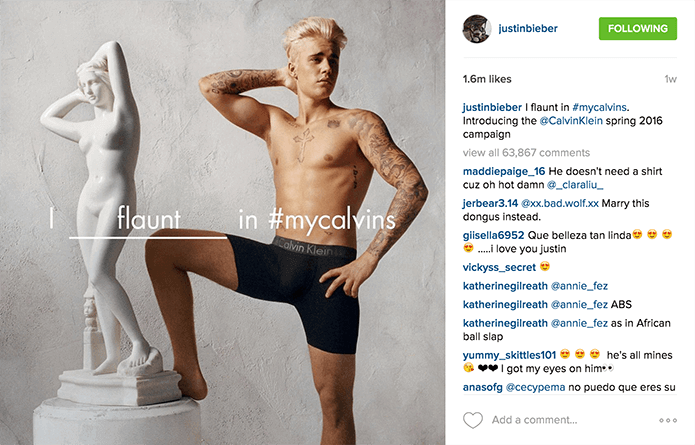 This campaign has dramatically increased Calvin Klein’s growth on social platforms. Since the launch in February 2014 their Facebook has increased by 2.2 million followers, Instagram by 1.8 million and Twitter by 1 million. Being able to capture the attention from consumers in a way that doesn’t seem forced is key in retaining consumer loyalty. There is seemingly no limit to the ways in which the brand can utilise social media and the power of celebrity endorsement.